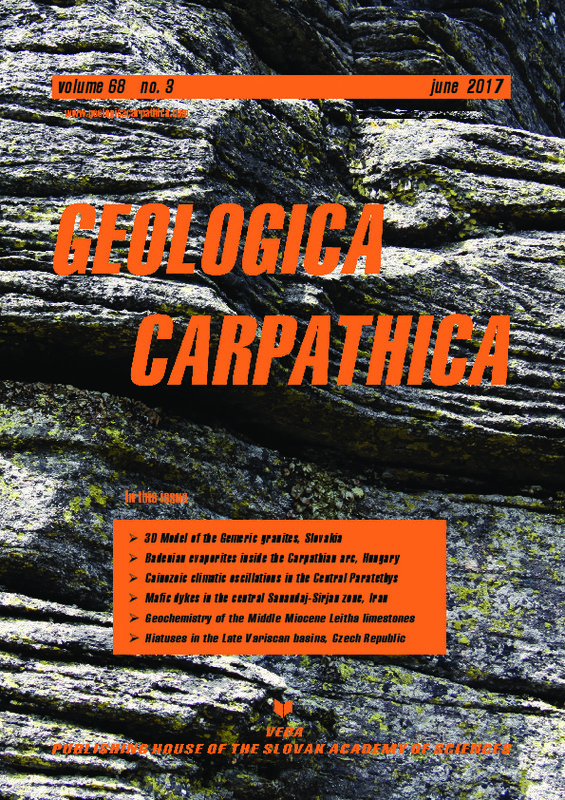 Abstract: Significant changes in the stratigraphy of the Central and Western Bohemian Upper Palaeozoic basins occur during or shortly after hiatuses. The different extent and changes in the depocentres of the Radnice and Nýřany members (Moscovian) in the Plzeň Basin clearly indicate changes in the structure of this basin taking place during a break in sedimentation between these two units (311.9–308.3 Ma). Thick weathered rocks that occur in boreholes in the Mšeno–Roudnice Basin indicate another sedimentation break (305.9–304.1 Ma) between the Nýřany Member and the Týnec Formation (Kasimovian). Another possible hitherto undiscovered hiatus occurred between the Týnec and Slaný formations (Kasimovian–Gzhelian, about 304–303 Ma). The most significant changes in the configuration of the basins occurred between the Slaný and Líně formations (Gzhelian–Asselian, 301.6–300.6 Ma). This is indicated by deeply cut river valleys at the top of the Slaný Formation, by high thickness of weathered deposits occurring immediately beneath the Líně Formation, and mainly by the shift of depocentres from the southern to the northern part of the Central Bohemian basins. The hiatuses between the Radnice and Nýřany members and between the Slaný and Líně formations are accompanied by significant changes in the depocentres, and they are therefore interpreted primarily as tectonic events related to the extensional collapse of the Variscan orogenic belt. By contrast, the hiatuses beneath and above the Týnec Formation are interpreted as being the products of lower sedimentation rates during drier climates, which is consistent with the characteristics of the sediments, correlation with other Central European basins, and with climate models for this period. Due to the characteristics of the Líně Formation, in which the effects of climate aridization are clearly seen, the authors presume that tectonic as well as climatic changes occurred at the hiatus between the Slaný and Líně formations.